What did you do with your SuperHawk today? Sent my rear axle to Pitbull to get a trailer restraint system made for the hawk. Forks are with Jamie getting some love. Washed her and clean and lube chain and sprockets. Lots of simple green involved. took off the clutch cover to swap er out to find my water pump impeller was more than just a little bit corroded. had to order new impeller, mech seal and oil seal. threw in some new dowels as well. Got my axle sliders in for my up and coming 929 front end. Rode it to work. Rode it home. Laugh it up, fuzzball. Rode to work, lunch, then home. 12 miles total. 6 wheelies. Oh ya , my last ride in October 2011 had to cut it short and park it .. WHY you ask ? motor made this crazy-*** sound .. like some hammer bashing metal fabber !! Not too much just a quick ride home from the South Bay. Last edited by 8541Hawk; 01-18-2012 at 10:53 AM. Nice video! Bike sounds great regardless of the wind. Bought her NIB in 1999 and still have a thing for the old beotch..
and others issues I cant remebr right now. Let's hope you can get her back on the road soon! On a better note, I rode mine to work every day this week! Some days were as cold as 28 degrees, but most rides were in 55 degrees +/- 10. Today it is supposed to get up to 75. Crazy. I have a 5k to run, so it will probably snow next week, lol. May I suggest a Ninja ZX6R regulator? Cheap off the bay, easy to install. A friend installed my new ContiMotions then a few of us went for a scrub-in ride. I'm left with .5 inch chicken strips, there would be none except that I'm chicken. That was the first time I've ridden the bike without wooden tires. Stop reading this and get new tires already. Installed a Scotts steering damper, mounted up some 'Stones. Slowly getting ready to attack NOLA in three weeks! Tried my hand at a partial bafflectomy last night (very happy with the results), and gave her a quick wash today before showing her off to friends. Got some detailing in while the wheels were off, my friend is a retired mechanical engineer from Germany. A true stickler, he had me cleaning bearings and the swingarm and such while he worked on the tires. Gee, get yer tires done by a monkey at some shop, or get them done by a mechanical engineer(who also worked for Honda for 10 yrs just saying). This morning before work I removed the PAIR system and all EVAP canister hoses. Need to pick up caps and plugs in the AM. Nick, looking good. We should hook up for a track day soon. Willow Springs is real good for our bikes also. Our bikes do ok for a so called touring street bike huh! yeah, people were saying annoying stuff like "wow, you're doing well for your first ever track day, I can't wait to see what you can do with a modern/light bike!" or "once you get a track suitable bike you're going to haul ***!" Yep. Agree with all of the above. Most people don't even know what a superhawk is? 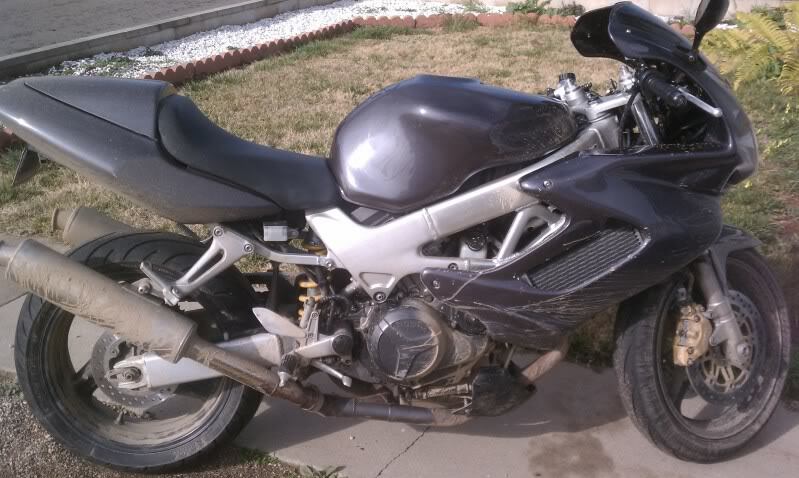 If you really want to have fun, just tell them its a 650cc bike just like the Suzuki sv650. Everyone raves about SV650 (I do too) but in all honesty our bikes are just as cheap, have way more power and stock for stock have better suspension. I'll post up a date in the group rides for a willow springs Superhawk trackday. Your going to really like the big track on the Hawk. Ride safe. Walked past it while under the cover in the garage, sadly wishing there wasn't snow on the ground, dreaming of springtime. Got a wild hair and did a complete bafflectomy last night. Rode her to work today. Doesn't seem much louder than the partial I had already done, but it does seem a bit deeper. I like, but some D&D's are likely in her future, lol. converted to single sided exhaust...one of my slipons was leaking and there was some issues with a broken clamp bolt on that side, so I just did away with it...bike runs much better now and sounds awesome. I was surprised; it didn't make it much louder at all. Does what I did yesterday count? Flushed my brakes so got to take a quick run to the test track a.k.a. Calaveras Rd. Now in the summer you can carry 2nd and 3rd on this road but in the winter you need to keep things in check a bit.... Also we just had a storm come through, so the road is pretty dirty and a bit slippery in places. I can post up the other way if you want to see it..... it still has to upload. Quick Reply: What did you do with your SuperHawk today?